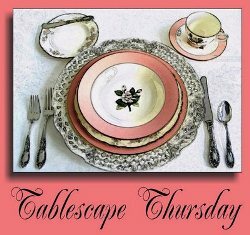 Welcome to the 462nd Tablescape Thursday! 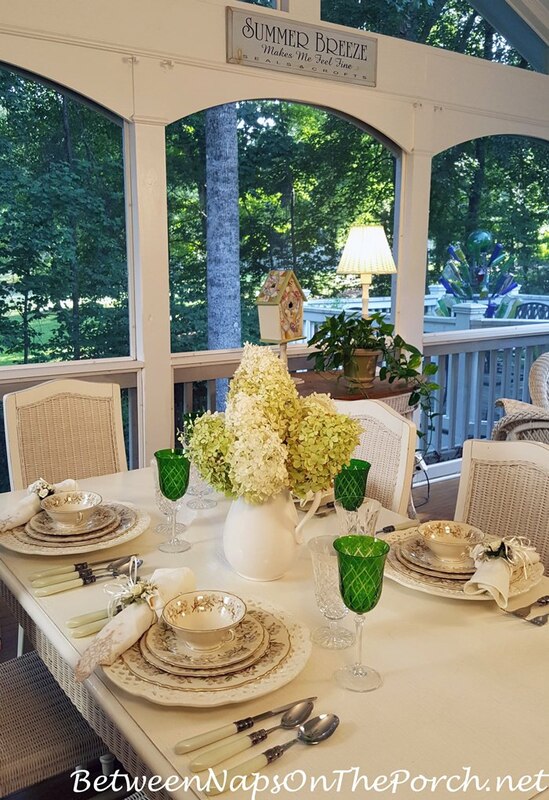 The inspiration for this week’s table came from the two Limelight Hydrangeas that are still blooming so beautifully out front. If you don’t already have a Limelight somewhere in your garden, I definitely recommend adding one. It’s such a joy in the garden and provides beautiful flowers for a wonderfully long blooming period. Love this hydrangea! 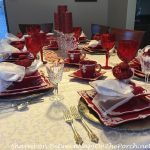 I really prefer setting a table for six for Tablescape Thursday, so I put away the soup bowls and added two more place settings. But before those soup bowls disappear, let’s see how they look in a place setting. 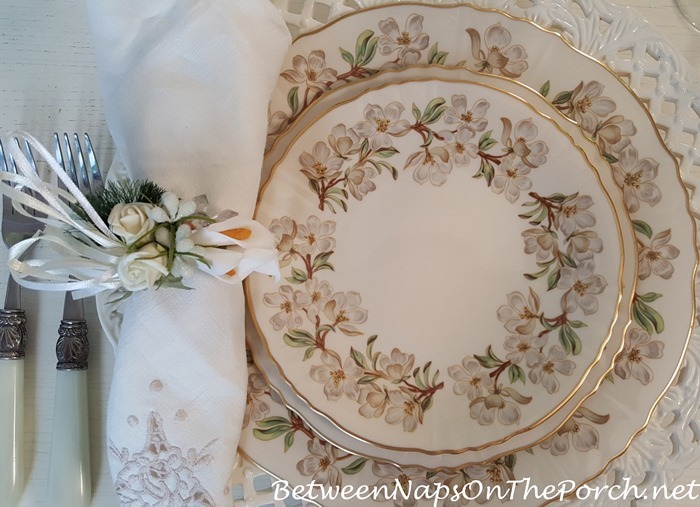 This vintage pattern is by the Syracuse China Company and was made here in the USA. The pattern name is, Orchard. I don’t remember where I found this set, probably antiquing. I think the first time I used it was in THIS table setting back in 2009. The green wine glasses are from HomeGoods, many years ago. I love the color and need to use them more often. Maybe I will now that I’m getting a bit more organized. I think the napkin rings were a find in Old Time Pottery. I’ve paired them with vintage embroidered napkins found antiquing many years ago. Here’s a better view of “Orchard” with the soup bowl removed, but the under-liner plate still in place. These under-liner plates would work great as dessert plates, too. This set included cups and saucers, as well as bread plates. Whenever I collect a beautiful vintage pattern like this, I feel such a connection with its previous owner. 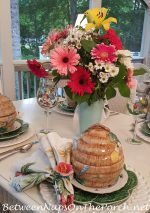 I know this pattern was special to them since they collected the cream soup bowls, bread plates and several serving pieces, too. The flowers of the Limelight Hydrangeas have begun that transition where they move from white to a soft green. It’s a gorgeous transition with a mauve pink coming in, as well. Evening was approaching…time to turn on a few lights on the porch. 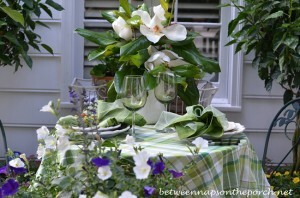 Susan – I have been religiously reading your tablescape blog for a few years now but this is my first time commenting. Your blog is one of the first things I read on Thursday mornings. Today’s setting has prompted me to comment, thanking you for all I’ve learned from you. This china is so beautiful and you’re right, one wonders about the original owner who certainly treasured this. 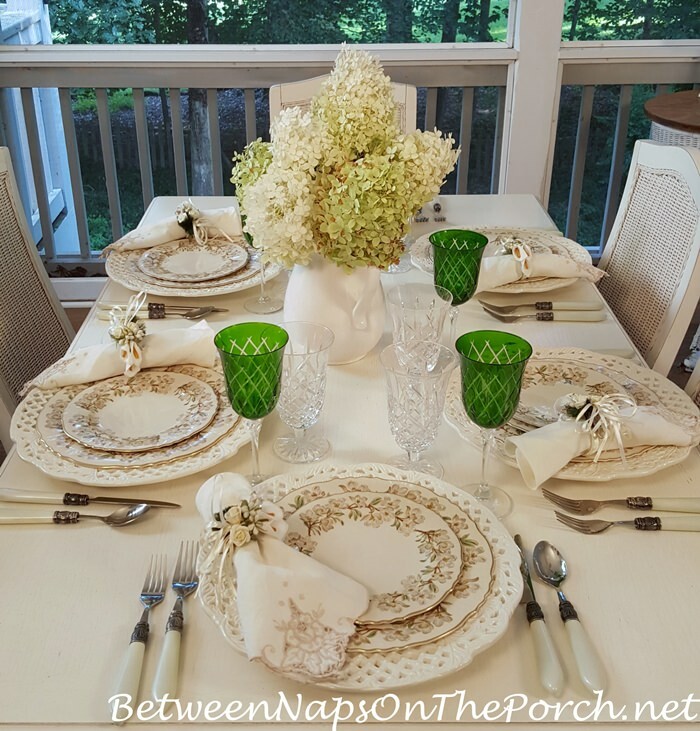 The green goblets and the green in the hydrangeas work so well with the china. Really a beautiful setting. Thank you! Thanks so much, Michael! Your comment made my day…so appreciated! ♥ I sometimes feel that way about vintage or antique furniture that I find while antiquing. There’s just a connection there sometimes, like you feel the same love and appreciation its previous owner must have felt, and now you’re being entrusted to care for it for the next generation. I love your blog and have been a subscriber for many years now. I get so many wonderful ideas. This tablescape is so beautiful. I thought how wonderful it would be for Thanksgiving. I am so jealous that you are going to Ireland. Can’t wait to see all you do. Have fun and be safe. Your tablescape is enchanting. The china is absolutely beautiful. I’m sure it was loved by someone long ago. I’m feeling your upcoming trip to Ireland with the lovely green wine glasses. 🙂 I love everything about this table! Another beautiful table! 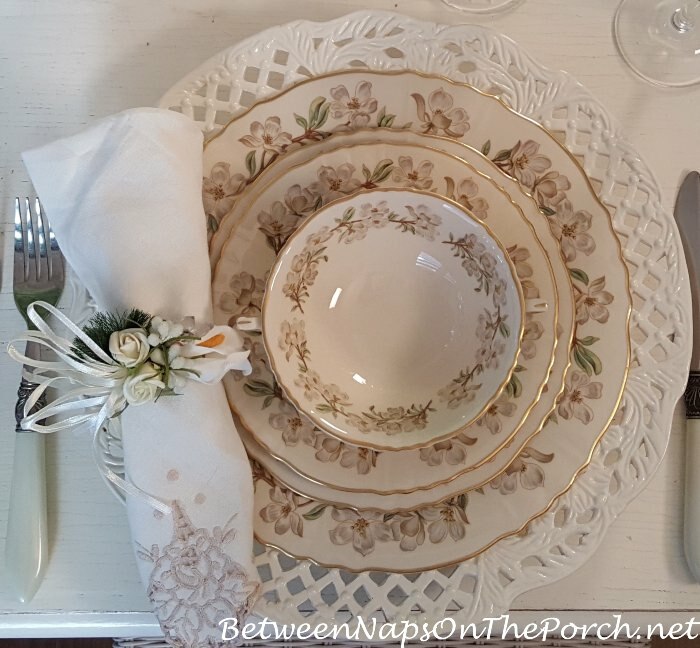 This china is so soft and makes for a dreamy, romantic setting. Your limelights are just gorgeous! I need to put one of those in my yard somewhere. A pot may be my best bet. Did you do anything special to yours to overwinter in the big pots in front of your house? Which direction does your house face? I don’t think I realized that they bloom longer than the mophead varieties. That makes them even more desirable. Where did you get your “Summer Breeze” sign? I am a child of the 60’s and that always spoke summer to me. Love your posts, always positive & uplifting….have a beautiful day!! Beautiful! The green glass goes well with the limelight colors. Love your comments about the dishes’ previous owner (could be several? )..they will always be cherished by someone. I have a question: Can you please post a picture of your bottle art that I keep seeing in the background on your deck? I got ahead of myself and ordered blue bottles on Ebay and I could have just bought the beer at Walmart and waited for my husband to drink it! By the way, where do you get your energy? You’ve been very busy! What a beautiful china pattern and the green goblets really set it off! I will think differently now when I see a full china set at an Antiques store. In my Family we have several sets of china that belonged to my Grandmother, Great Aunt, a Friend’s Mother and everytime we use their china we share memories about them and have a fun time. Thanks for that link, Julie! Love those bowls…very tempting to buy those since and I don’t have that style soup bowl, yet! Thanks again for the link! Try Replacements for missing bowls for your set. I always seem to find discontinued pieces there . Susan, I love your blog. You inspire me to attempt things I doubt of myself. I genuinely love most of your items and designs…as you know Re you’re porch sign for starters; birdhouses, hydrangeas, etc. You always share! Grateful! Keep up the detailed work and blogging. We need what works and what fails. You are appreciated. Beautiful, Susan. Very elegant. You are so right about using things you can access. Out of sight ,out of mind. My dh passed away suddenly Memorial Day and I will have to sell my home. Too big for me to handle alone. I will have to get rid of my dish collections, I am finding things I didn’t remember I had. It’s a monumental task. I understand about wanting to downsize your home, I am thinking about doing that in a couple more years…envisioning a small house with a screened porch and hopefully a little storage shed for those things I still want to keep. Do you have a place in mind where you would like to move? Your limelight trees are incredible. They are perfect in your landscape and so convenient for cutting flowers. Definitely a win/win! I like the soft palette for the occasional break from bright summer colors. Hope the limelights dry nicely; the colors look perfect for early fall. This setting has such a beautiful vintage feel. I love hydrangeas in all colors. I remember a beautiful yellow, hot pink and tangerine beach wedding where they had dyed them yellow. I was smitten. Enjoy Ireland. It’s one of the few places I think I would like to visit, I know it will be lovely! 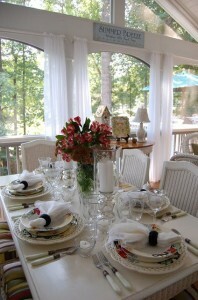 I love vintage tablescaping – it has a unique quality that cannot be readily matched with current retail. Even by adding recent elements to the overall, it still makes my vintage heart sing. I love the limelight, and just added one this year to my garden. It makes a beautiful centerpiece for tablescaping. Thanks for hosting, Susan, and i look forward to seeing more of your dishware rotations. Btw, my hairdresser was just complaining to me yesterday about receiving a UPS-delivered, extensively damaged cabinet from Home Depot for her product storage. I relayed your experience as she told of the unbelievable state of the cabinet delivered – chunks of shelving missing and a box crate demolished. She will be doing as you did with WM, only her source was HD – having them delivered to the store, where she will inspect (unboxed) before ever taking home. OMG Susan, you did it again to me!!! The vintage Syracuse Orchard china is SO PRETTY I had to have it, especially since they stopped making it 51 years ago! I raced over to Replacements.com and bought 8 dinner and 7 salad plates. I’ll have to find that 8th salad plate somehow. This is SUCH a pretty pretty table, I just love it. You are blessed to live in a climate in which you can grow gorgeous hydrangeas in your yard, I am so envious! Here in Phoenix even through the wholesale flower market, just ONE hydrangea is between $5.00 and $8.00 per stem. The wholesale flower market has the freshest flowers available, but even so, I have to be careful when I pick out hydrangeas there. By the time the hydrangeas get to Phoenix they may be one to two days old and they’re already starting to wilt. P.S. : Getting ready for dear hubby’s eye-rolling when yet another large box of dishes shows up on my doorstep. It’s not the cost that bothers him, it’s the space my dishes take up. But of course, that doesn’t stop me, LOL. I really love your “Orchard” dinnerware! I also learn so much from your articles. We have quite a few hydrangeas in our front yard, but they range from deep raspberry to true blue. They are my husband’s “babies”. The other night we went out to eat and in front of the restaurant were beautiful limelight hydrangeas. My husband, the gardener, wondered why they were still a green color. I piped up “They are Limelights”. I finally knew something about gardening that he didn’t. Thanks for that info. I don’t remember seeing these dishes before. Such a pretty pattern and I like the hydrangeas as an accent with them. Limelights are also my favorite- mine are at the early stages of the flowers forming. They are truly one of the easiest to grow and reliable. I hope the new plan works out for the delivery of the cabinets to Walmart. You’ve made a big effort for this- it’s time for it to come to fruition! Another very pretty tabletop. 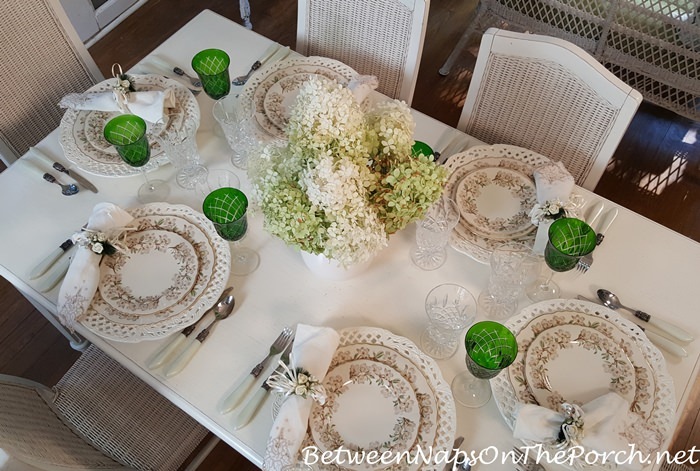 I am thinking you could keep the bowls on the middle four place settings and add in a neutral bowl such as ivory- on the ends and it would still be pretty. I have some patterned clear glass little bowls I use sometimes when I want to add dimension but still see the plate pattern below. 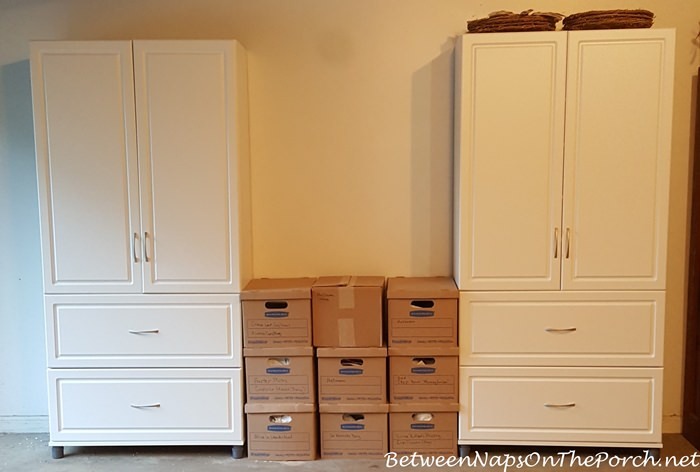 Downsizing is a topic around here too. We currently have a large walkout lower level, but a nice unfinished basement would be an awesome storage/staging area. We would finish the walls and floors and it would be wonderful to have everything there by season. Have a wonderful trip. You will love, I know. Orchard is my new favorite and this is one of your best table settings. Thank you for sharing. Simply perfect. I can’t wait to see your pictures from Ireland. Replacements, Ltd. has the saucer for the cream soup bowl for $3.99. Replacements is about 20 minutes from my home. I was actually there earlier today. Beautiful setting! I love hydrangeas. The plates are gorgeous. Hi Susan, my name is Lalia Perry and wonder of wonders I live in Dunwoody! I’ve been reading your blog for about nine months. I have enjoyed all your trips and your life on the porch. I am seriously considering joining you, other bloggers and friends on the trip to Ireland. I will check into it in the morning. I can’t quite believe I might do this but I saw Ned Devine too and had the same reaction that you did. I will keep you posted on how things are progressing. Hi Neighbor! Come join us! I think it’s going to be an awesome trip! Let me know if you’re able to join in and if you can get a flight. Hopefully it’s not too late. Beautiful! The pops of green just bring it to life! The Orchard pattern is so pretty. The green glasses are stunning. How I miss hydrangeas here in FL. Your table setting is truly romantic and soothing. Thanks again for making my day! Your table is so pretty. 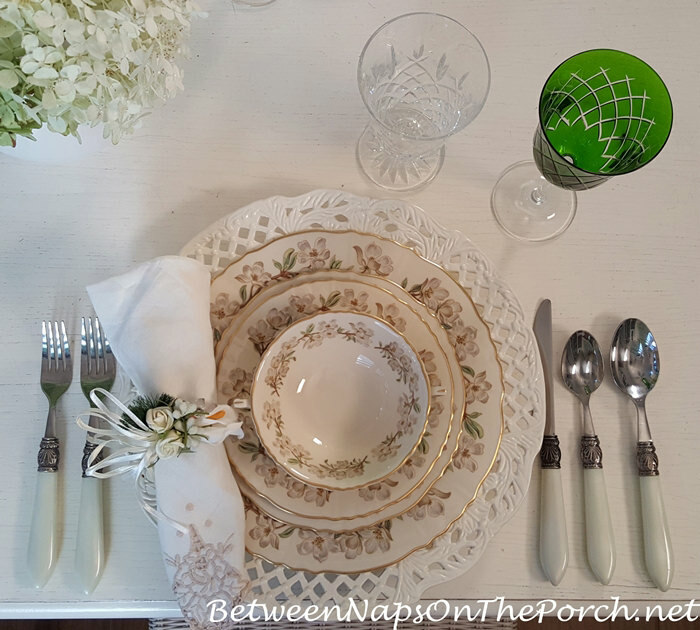 I really like vintage china and linens. It takes you back to another time. 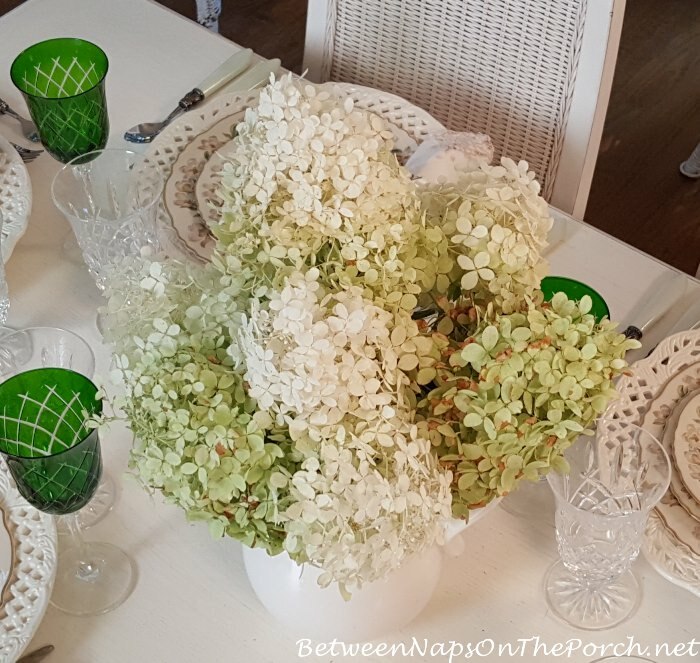 Love my limelight hydrangeas but I rarely bring them inside for floral arrangement since ants are also loving them. Any suggestions for the ant problem? I’m thinking my best option is to limit myself to cut flowers on the deck. Susan, the cream and green color combo.is inspired. The green goblets are elegant and provide a whopping pop of color without overwhelming the overall romantic vibe you were going for. 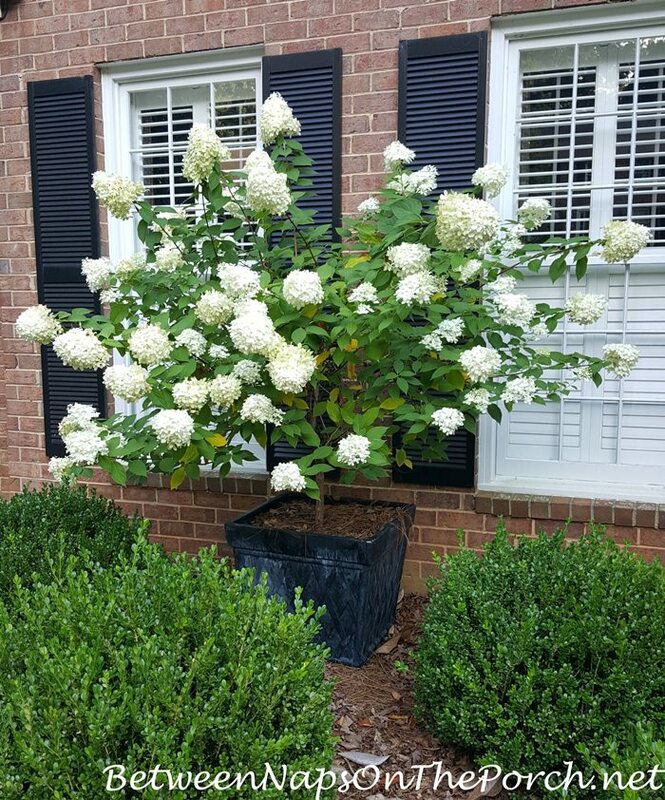 What can I say about the versatile hydrangea? From off white to deep purple/burgundy, it is amazing what colors can be achieved with acid/alkaline soil. 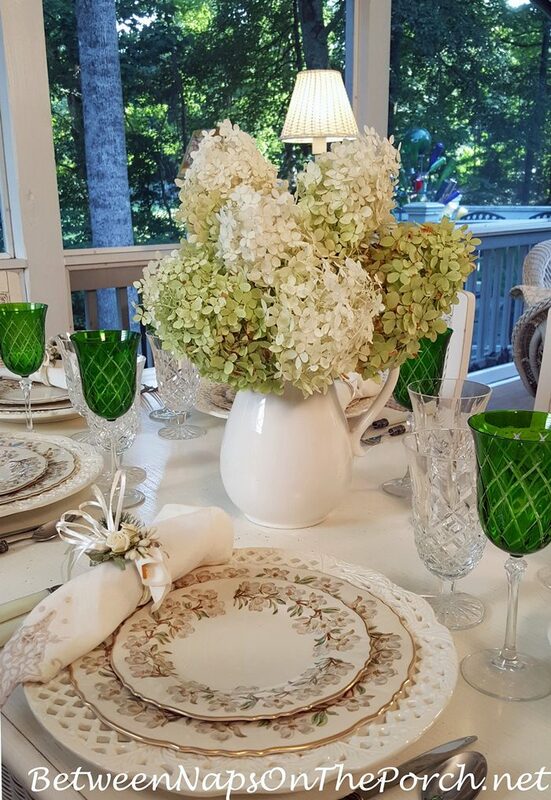 LOOOOOVE the green from the hydrangeas and the goblets!! It adds the PERFECT touch! As always, your blog just lifts my spirits! Thank you for everything you do! Hi Susan! I am making my wish list and would love to have some colored-handled flatware ( Hampton Forge) that you often show. I think they are just beautiful. However, they don’t get very good reviews. Can you give me your opinion? The price is definitely right compared to so many others. So far, mine has held up well, but then I wash it by hand. I do not think it would do well being washed in a dishwasher. Flatware with plastic-type handles never fair well in dishwashers…would probably fade and crack from the heat. This flatware is pretty inexpensive, so I think it’s worth the cost, but it definitely won’t be as durable as an all stainless flatware would be. Hope that helps a bit, Delphine.